Mornings with the Mix are filled with laughter as Bob & Sheri help you wake up and start your day. Calling themselves “America’s First Reality Show,” Bob & Sheri will entertain you with stories from their lives and the day’s headlines. The chat room opens each morning for listeners to call in and you don’t want to miss features like “Sports Confuse Me,” “Morons in the News,” winning with the “Wheel of Prizes” or “Lamar’s Movie Reviews.” Max and Todd chime in to keep things lively and you’ll find yourself laughing out loud to the radio! In the 1980s, Bob hosted Charlotte’s award-winning television program PM Magazine and served as the show’s national humor reporter/producer. In 1986, he received an Iris Award for Best Produced Local Television Feature in the Nation for a piece on the horrors of prom night. The award is one of many Bob has received for both his broadcasting and community service. Bob returned to radio in 1990, handling morning drive for WBT’s struggling FM counterpart, WBCY (now WLNK). In 1991, managers launched a lengthy nationwide search to find a female co-host for the show. They listened to some 65 tapes, but Bob was adamant that they not hire a giggle box to laugh at his jokes. He wanted a partner who could really add to the mix. Bob & Sheri was born and, a decade later, their raucous, real-life humor is delighting listeners in more than 60 markets around the U.S.
SHERI LYNCH began her career in television, writing and producing paranoia-inducing news teases. Having tired of warning the world about the dangers lurking in dirty restaurant kitchens and sketchy daycare centers, she agreed to create a commercial for a new radio program. Then enters Bob Lacey, wearing one of his favorite preppy outfits. “Lose the red sweater,” she suggested. “You don’t want to look like an elf, right?” To pay her back for that disrespect, Bob invited her to be his guest on-air. That was a meeting of soul mates, and the beginning of the long, happy Bob & Sheri partnership. Sheri has been featured in numerous trade publications and has earned many professional honors. In 2002 and 2005, Sheri received the American Women in Radio and Television’s (AWRT) highest honor, the Gracie Allen Award, in recognition of her outstanding achievement in the realistic portrayal of women in media. In 2004, Sheri won the Charlotte Business Journal’s “Women in Business Achievement Award.” She has been named Best Local Radio Personality by Creative Loafing magazine for over ten consecutive years. 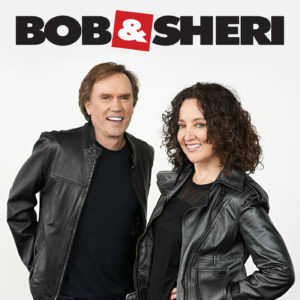 Bob & Sheri has also received six nominations for the radio industry’s highest honor, the Marconi Award, presented by the National Association of Broadcasters. Sheri’s best-selling first book, Hello, My Name is Mommy (St. Martins Press), is currently in its fourth printing. Her second book, Be Happy, Or I’ll Scream!, was released by St. Martins Press in late February 2006. Sheri is now single, with two young daughters.